Ann Marie Grimes was our second child, first daughter, born in October 2009. 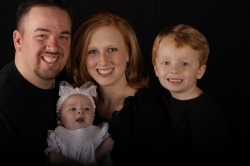 Annie was the result of a planned, healthy, full-term pregnancy and delivered absent of any complications. She was a healthy 7lbs., 3oz. baby girl. 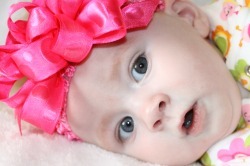 She passed all infant screenings with flying colors and got a good Apgar score. We left the hospital healthy and happy. No red flags were detected at this time. At home, Annie was doing great! We were adjusting to having a baby girl and the bows and frills were so much fun! During my time at home, we prepared for the holidays, enjoyed shopping and traveling. Annie even got to visit Walt Disney World for her first Christmas! Life truly was perfect in every sense. 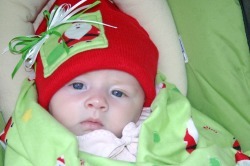 During the Christmas holiday (11 weeks of age), her appetite declined. We noticed at 2 weeks of age that she snored....very loudly. This was a bit strange to us, but we were told that "no two babies were the same" and to have no worries. At this time we also were getting several comments on how quietly she cried. We thought this was just the difference in a boy and a girl and assumed she was going to have a "laid-back" dispostion. We also were noticing she was using her belly to breathe. 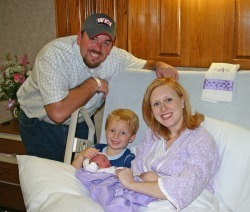 On December 27, 2009, we saw a pulmonary specialist at Vanderbilt Childern's Hospital. They diagnoised Annie with Laryngomalacia. This was something commonly seen in their office and it was not alarming nor life threatening. The larynogomalacia could affect an infants appetite and it would cause a stridor sound, which was her snoring and weakend cry. We were releaved that it was something simple and something she would grow out of by 6 months of age. In January 2010, I returned to work after a 12 week stay at home. This was extremely hard for me to do and something kept telling me this was not the right decision. However, I thought it was just the "nervousness" of leaving her at daycare. 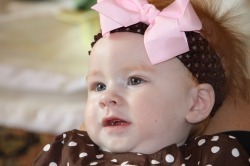 During the 3 weeks she was at daycare, her eating continued to decline and she was not gaining weight. Her teachers were commenting on how alert she was. We just thought we had a very smart baby. They also commented on her hands turning inward. We returned to Vandy on January 26th for a check up on the laryngomalacia and told the doctor she was missing milestones. She was lacking movement and was not holding her head up. I described her as "infant like". He mentioned we should see a neurologist. We left Vandy and returned home not knowing what to expect. The neurologist office called the next day and asked to make Annie's "muscular atrophy" appointment. I quickly jotted this down at work, made the appointment and hung up the phone. Instantly, I googled the term and screamed out when I read, "death sentence". We rushed to daycare, got Annie and went home to research more. Not willing to wait for our February appointment, we ended up in the ER on January 28th, where the swallow study, the chest x-ray and an exam showed all signs pointing to SMA. The photo above was taken only 4 days prior to when our world would fall apart! Annie was 3 1/2 months old. After a 7 day stay in the hospital, where we discussed our care options, Annie's lung collapsed and the doctors estimated her lifespan to be only two month, we took this family picture. Notice our little angel is in white! We decided on palliative care and fearfully awaited the official blood work that would confirm the SMA diagnosis. Our family and friends came to our rescue helping with meals, monetary gifts and so much love and support. We decided to live the next 60 days to it's fullest! On February 13th, her 4 month birthday, we ended up at the ER with a fever and were told that the blood work did show a positive test of SMA - Type I. The picture above was taken only two days before the confirmation. Annie was given so much love and attention. We did everything to keep her happy and comfortable. Once home and given this acute care, she actually starting eating much better and seemed to be stronger. She would kick her legs some during bathtime which she loved and she continued to move her arms a little to chew on her fingers. The unknown was absolutely terrible, but we kept praying and gave Annie our best smile. As we waited to surpass that two month marker, Annie gave us some wonderful smiles and memories. 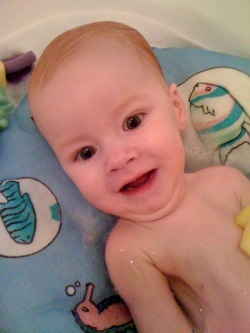 The picture above was taken on March 27, 2010....just one day before she was estimated to leave us. Maybe Annie was going to be our miracle baby. Father's Day 2010, Annie had a very tough day. She did not eat as well and just seemed very unhappy. Of course any change in her mood or decline in oz., we paniced. Fortunately, she did much better the next week, but something was different. Her swallowing was getting much weaker. It seemed with each day, she ate less and coughed more. I knew we were getting to the end. As always, she kept giving out those big, beautiful smiles. At 1:00 am, Friday, August 6th, Annie woke up struggling and we feared we had lost her. She stablized and seemed better. We gave her a bath, which she enjoyed and read books and of course got dressed up. She took 1 1/2 oz of formula, slept two hours and woke up very upset and lathargic. Trying to comfort her with more formula, she could not take her bottle. Annie had officially lost her ability to swallow. Annie's struggle with SMA came to an end that night. She was surrounded by her family and passed in the arms of her mom and dad. She was 9 months and 24 days. She would have been 10 months old in only one week. It was a moment of great saddness, but also a moment of relief. Her pain was gone, but our pain was felt so deep. We will always miss "Our Annie Girl"! To read our personal journal, please click HERE! The information below was pulled from a mom who lost her daughter at 5 months old. Her words were written so well, I truly didn't know how else I could say it any better. "The unfortunate truth is that our story is not unique. Two children are born every day in the United States with SMA, and I have never read a testimonial where the parents were expecting a child with this disease. Devastated parents are blindsided by the diagnosis, even though SMA is believed to be as common as Cystic Fibrosis. While there are many groups and individuals lobbying for prevention and screening, supporting families who are surviving with SMA and researchers looking for a cure, there is no one successfully telling “Joe Public” that SMA exists. We felt compelled to try to fill that niche." We look forward to great things in the next year. There are plans to raise money to help various SMA organizations and we plan on raising awareness any way we possibly can. Annie touched many lives in her short 9 months, but we think she has a lot more to do with her story.